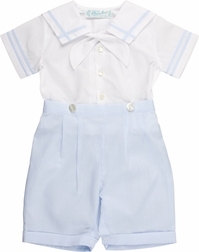 Cute romper for baby and toddler boys in the tradition of sailors! The outfit is made with a white blouse and light blue trousers. 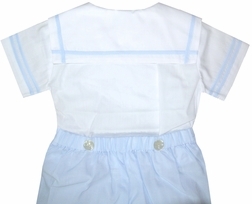 The blouse has square lapels trimmed in blue strips of fabric as do the sleeves. Just under the collar is a white sailor's knot tie. 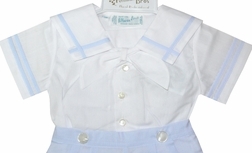 The back of the outfit of course has the square sailor's flap collar!